AERIAL: Cinematic view of empty golden-lit golf course on the exotic island. AERIAL: Flying around a stunning limestone formation on tranquil exotic island. 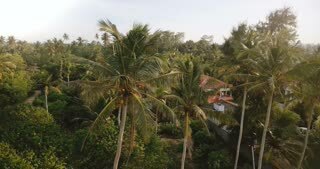 Drone flying around big green coconut palm trees and tropical vacation hotels and houses on exotic sunny resort island. AERIAL: Pristine ocean water ripples in the breeze blowing by the exotic island. DRONE: Flying past a lush exotic island nature and towards the blue open seas. DRONE: Flying above the turquoise water and palm tree canopies on exotic island.